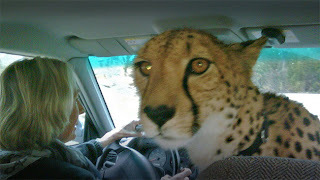 Pawperty: Did you know cheetahs ride shotgun? The Cincinnati Zoo has a traveling version of its Cat Ambassador Program where zoo trainers bring a cheetah and several "smaller" cats to local schools. And that means road trips. But not in a cage. Nope. When these cheetahs go out on the town, they ride shotgun. This is Sara, who became the fastest animal on earth back in 2009, breaking the 100 meter sprint record at 6.13 seconds. To put that in perspective, Usain Bolt's official human record is a languid 9.58 seconds. World record holders aren't the only ones who get to ride in the zoo's Subaru Forester. 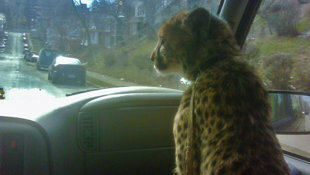 Below, find a photo of another cheetah named Nia — who was just a year old when the picture was taken — as she looks out at Cincinnati. Are we the only ones who think it's weird that a program requiring the disclaimer of "Due to the nature of wild cats, students will not be permitted to touch animals" probably shouldn't be running said wild cats around town in the front seat of a car? Sure, we've seen this type of thing before, but that was Dubai — not Ohio. What if there's an accident? Or what if someone sees the cat in the front seat and, you know, flips the hell out? So is this legal? Although we know Ohio has pretty lax laws on exotic animals we know that it may be illegal to do so on the Ohio Turnpike thanks to Section 5537-3-01 of the pay-for-use road's rules. The section concerns limitations on use of the turnpike and clearly states: "Vehicles transporting animals or poultry not properly secured or confined." We're assuming that could mean the front seat. Of course, Cincinnati is nowhere near the turnpike and otherwise it appears Ohio's statutes are silent on the subject. But this is Ohio we're talking about — so we're just impressed they have laws of any sort.